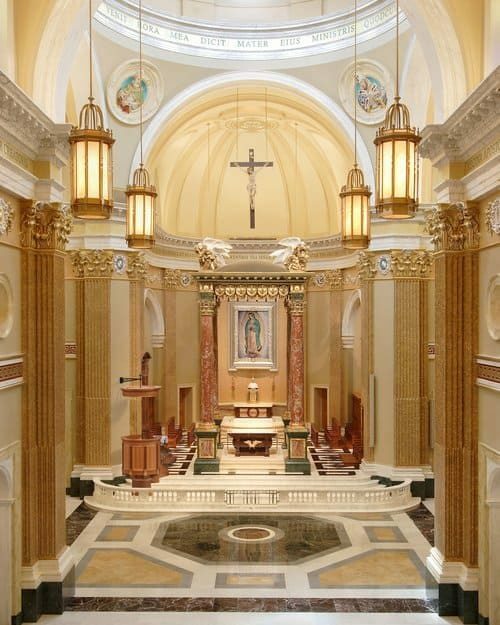 Shrine of Our Lady of Guadalupe Restoration | John Canning & Co.
Church Architect Duncan Stroik chose John Canning to create the iconic interior decoration scheme to compliment the newly constructed Classical-style shrine. And the Canning Co. was selected to provide the metal framing, three-coat plaster, the installation of the intricately detailed ornamental plaster, and the multiple decorative painting treatments that John designed. If you're very lucky, work hard, and say your prayers, you may get the once-in-a-lifetime professional opportunity that we received when we were selected to work with church-architect Duncan Stroik to provide the liturgical design scheme for a new shrine. 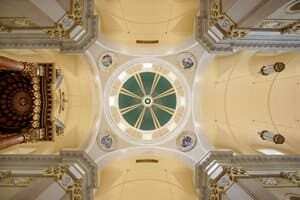 We designed and executed all decorative finishes, including many faux marbles and other stones, gilding, and a dome ceiling featuring a turquoise sky, selected to match the color of Our Lady’s mantle. The gold-leaf constellations represented on the ceiling of the dome replicate the sky on the night of Winter Solstice as viewed from Mexico City in 1531, when Mary appeared to Juan Diego. We also provided metal framed three-coat plaster and the installation of all ornamental plaster.